Republicans held onto control of the Wisconsin Senate on Tuesday, beating back four Democratic challengers in a recall election despite an intense political backlash against GOP support for Gov. Scott Walker's effort to curb public employees' union rights. Fueled by millions of dollars from national labor groups, the attempt to remove GOP incumbents served as both a referendum on Walker's conservative revolution and could provide a new gauge of the public mood less than a year after Republicans made sweeping gains in this state and many others. Even though the Democrats failed to capture the majority in the State Senate through these recalls, I think they set the tone for 2012 and have given Americans a bigger picture - democracy at work. I don't see this as a loss. This is a sign of bigger things to come and more work to be done. Did Citizens United play any role in the outcome of the recall elections? Do yesterdays recall elections set the tone for 2012? Did Democrats loose the War or did they win the Battle? 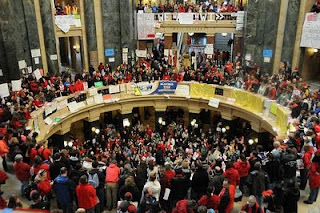 Will the recall elections impact the likelihood of Scott Walker being recalled in January 2012?